A very strange set came out in 1961. Quite what a Bentley Continental, Chevrolet Corvair and Ford Consul Classic had in common escapes me to this day. 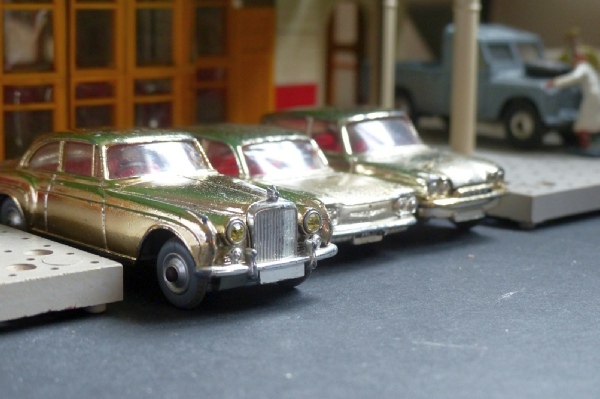 I can only imagine Corgi had vast stocks of the two odd cars and thought they’d sell ‘em off with the always popular Bentley. Indeed, they could get even more by chucking them all through a golden paint finishing unit but the red interiors for the two normally lemon may have cost a bit more. They charged 21/- that’s 21 shillings or a guinea for younger visitors - hence, presumably, the name. Now, the cars were listed at 7/7d and two at 4/9d in the 1961 catalogue. That totals 17/1d so Corgi were getting nearly 4 shillings extra! That’s quite a mark-up when you remember that suspension and interior only added one shilling to revised editions of things like the Jaguar. Anyway, at the moment I only have the Chevrolet and Ford which are available individually. I am looking for another Bentley and a box. If you need the set in the meantime then get in touch as complete sets, whilst scarce, are around.